make us who we are? 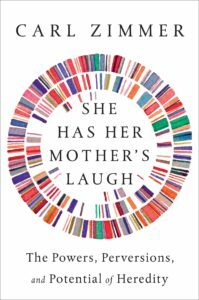 Science Writers in New York invites you to spend an evening with Carl Zimmer, who will discuss his latest book She Has Her Mother’s Laugh: The Powers, Perversions, and Potential of Heredity (Dutton, May 2018). Carl will talk about his book with SWINY co-chair David Levine, and answer questions about content and craft, and sign books, which will be sold at a discount. 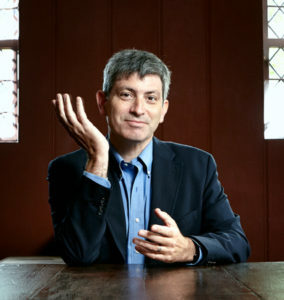 Carl Zimmer reports from the frontiers of biology, where scientists are expanding our understanding of life. Since 2004 he has written about science for The New York Times, where his column “Matter” has appeared weekly since 2013. He is a popular speaker at universities, medical schools, museums, and festivals, and he is also a frequent guest on radio programs such as Radiolab and This American Life. Carl has won many awards for his work, including the Stephen Jay Gould Prize, awarded by the Society for the Study of Evolution to recognize individuals whose sustained efforts have advanced public understanding of evolutionary science. Admission is complimentary. Space is limited, so please RSVP by Thursday, June 7.